1. Ancient Hill with Pink Sky, 2019, enamel paint on board. 2. Signs of Grass on a Hot Hill, 2018, enamel paint on board. 3. Geological Slice, 2018, enamel paint on board. 4. Green Summer Sky, 2019, enamel paint on board. 5. Night Coloured Landscape, 2019, enamel paint on board. 6. Hill with Red Hot Rocks, 2019, enamel paint on board. 17. Brown Bush Moon, 2018, enamel paint on board. 18. Garden of the Golden Hill, 2018/19, enamel paint on board. 7. Baked Pudding Hill, 2019, enamel paint on board. 8. Memory of Water, 2018, enamel paint on board, 2019. 9. Virulent Stars, 2019, enamel paint on board. 10. Clear Night Light, 2019, enamel paint on board. 11. Blue Moon Reflection, 2019, enamel paint on board. 12. Red Hill under a Silvering Moon, 2019, enamel paint on board. 13. Nightland, 2019, enamel paint on board. 14. Two Rehoboth Hills, 2019, enamel paint on board. 15. Full Moon near Garies, 2018, enamel paint on board. 16. Blue Moonlight, 2018, enamel paint on board. 19. Night Heat, 2019, enamel paint on board. 20. Round Hill near Rehoboth, 2019, enamel paint on board. 21. Candy Stripe Landscape, 2019, enamel paint on board. 22. Night Red Hill, 2019, enamel paint on board. 26. Flowering Thorn Trees near Windhoek, 2019, enamel paint on board. 27. A 1959-style Windhoek Koppie, 2019, enamel paint on board. 28. Red Anthill near Aranos, 2019, enamel paint on board. 29. Klein-Windhoek Koppie, 2019, enamel paint on board. 30. Thorny Shrubs near Avis Dam, 2019, enamel paint on board. 31. Table Bay Flashback Moon, 2018/19, enamel paint on board. 30. Yellow Moon near Kleine Kuppe, 2019, enamel paint on board. 32. Sectional Nightscape (Four parts), 2018/19, enamel paint and mixed media on board. 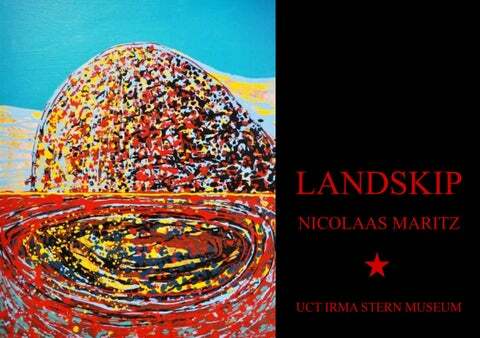 BIOGRAPHY Nicolaas Maritz was born in 1959 in Pretoria. He went to school in Pretoria and Port Elizabeth. In 1977, he qualified as an army chef and butcher. From 1978 - 1981 he received tertiary art education at the University of Cape Town. 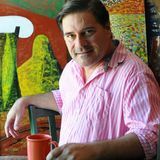 His first one man exhibition was held in 1976, in Port Elizabeth, and he has exhibited regularly at galleries and museums in South Africa and overseas. The artistâ&#x20AC;&#x2122;s works are represented in most of the art museums and public collections in South Africa. His work can be seen at the South African National Gallery, Pretoria and Johannesburg Arft Museums, the art collections of the University of Cape Town, Sasol US Museum, and the Sanlam art collection. Maritz has lectured in art and design at the universities of Cape Town and Stellenbosch, as well as at private art schools in Cape Town and Pretoria. The artist has received recognition for graphic design, and for illustrations of childrenâ&#x20AC;&#x2122;s and other books, notably two American illustration awards. Nicolaas Maritz has extensive internet presence, and any search result will show several sites, image galleries, as well as references to his work as an experimental musician. The artist lives and works in Darling, where he has a permanent exhibition space, the Maritz Museum, open to the public by appointment. His hobbies are cooking, gardening and armchair installation art.